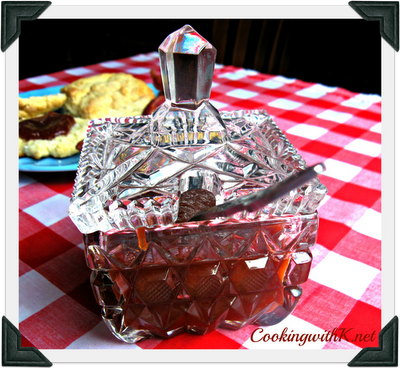 Growing up in the '60s, all I remember was homemade jams and jellies on Mother's breakfast table. It was a traditional event each summer to make Peach Butter from fresh peaches. We would wash all the peaches and peeled each one, leaving a little of the peach with the skin, because that is what she would make her Peach Butter from. Then she would slice up the peaches and put them in a pot on the stove and make peach preserves. I rarely see them any more, but she would also make Pickled Peaches that graced our table at Thanksgiving and Christmas. When it was all said and done, the only thing we threw a way was the seed. In June, it has become a tradition at our house to go to a Peach Orchard that is close to us. While we are there, we enjoy some delicious peach ice cream while we decide on the peaches that we are getting. This year I bought more than I usually do, so I decided to make a batch of Peach Butter. Since our garden is in full production, I decided to freeze the sliced peaches and make some Peach Preserves later. That way, I didn't have so much on me at one time. 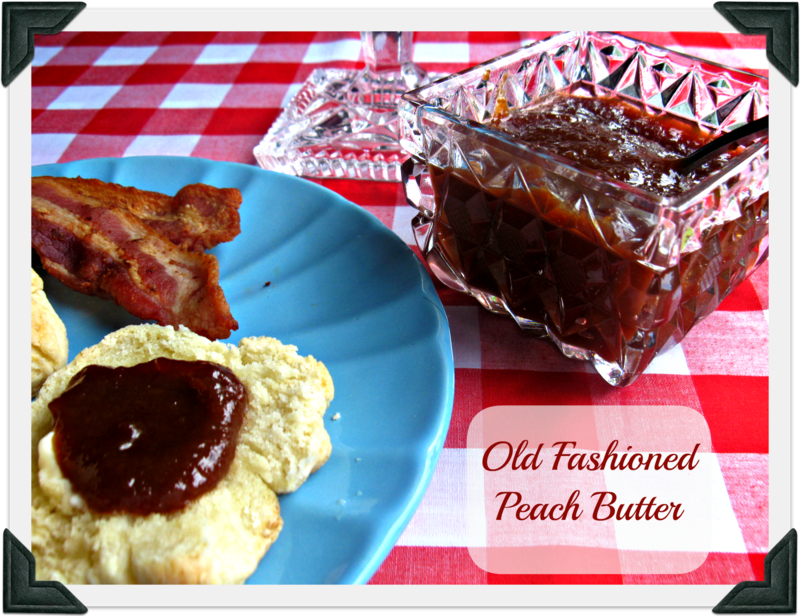 There is nothing better to eat Peach Butter with than homemade biscuits. This weekend Jim and I enjoyed a late breakfast with some delicious Cream Cheese Biscuits that you see here with some of the Peach Butter! Wash peaches and place as many as a large bowl will hold. With a sharp knife, peel peaches leaving 1/8" to 1/4" of peach with the peelings. As soon as the peaches are peeled, set the peaches aside, but put the peeling in a large stock pot on the stove and cover peaches with enough sugar that the peach peelings are not showing. This will keep the peach peelings from turning brown until you can get the other peaches peeled. Take the peeled peaches and slice them, discarding the seed. Sprinkle fruit fresh on them (look on the bottle for directions on how much), and toss them real good, being sure all is coated with the fruit fresh. Now you can freeze the peaches in Ziplock bags to use for cobblers, preserves, ice cream and other dishes later. Keep peeling, layering with sugar, and bagging all the peaches until done. Once all the peaches are peeled, and all of the peelings are in the pot with layers of sugar, you can add cinnamon, cinnamon stick, allspice, nutmeg, and cloves. On medium to medium high heat, cook the peelings for 4-6 hours until smooth and very little liquid.is left. To get the creamy and smooth texture of butter, transfer cooked peelings to a food processor or blender and process until smooth. At this time, if the Peach Butter has cooled down, heat until bubbly. Once the Peach Butter is hot, pour into prepared jars. Turn jars upside down to seal. Once cooled turn jars upright. Note: You can use the whole peach if you like instead of freezing it. If using the whole peach, chop them up to 1/4 inch cubes and process the same. This looks HEAVENLY! Homemade is the best. So glad that I found your blog! I'm a young housewife and mother of four and love traditional family recipes made from scratch. :-) I am a new follower and I look forward to seeing more of your recipes. Hi Faith ~ So happy you have joined CWK...always love company in my kitchen! Oh my goodness Kay1 Even if I wasn't fond of peaches...which I do love...this would taste wonderful being served in that gorgeous dish! I love it when you share recipes from generations past. MMMMM! Sure wish I had some right now. The peaches are just beautiful this year and your Peach Butter is a great recipe to try, it looks delicious. Hope you are having a great week and thank you so much for sharing with Full Plate Thursday. Sounds wonderful!! I'm excited to try to make this after our next trip to the orchard. Hopefully, my new peach trees will be strong enough to bear fruit next year, too! "Pinning, now!! I love peaches! I have been looking for a peach butter recipe . Since my gram died I have been missing her. She used to drive to Michigan every year to get peaches to make my peach butter! Thank you for the recipe. Please know that I will be thinking of gram while making it and eating it!